The National Park Service has two central mandates: to protect park resources and to provide for public use and enjoyment of them. But sometimes these goals are at odds: as the number of park visitors increase, they cause inevitable wear and tear on delicate ecosystems, cultural artifacts—and one anothers’ park experience. Friends of Acadia works with Acadia National Park to identify resources that are negatively impacted by increasing park visitation, and develop innovative and long-term approaches to mitigating these impacts—to preserve Acadia’s high-quality visitor experience for current and future generations. Leave your car behind and walk into the park! Unfortunately, these programs aren’t enough to completely solve Acadia’s transportation challenges. In 2015 the National Park Service launched a multi-year transportation planning process to brainstorm, assess, test, and ultimately select a set of transportation policies that will set Acadia on the “best path” toward a better future. Friends of Acadia has been an essential partner in this process by funding studies like a transportation model for Cadillac Mountain, hiring interns who contributed to visitor use studies atop Cadillac, and helping with pilot projects like the Acadia Car-Free Mornings. This work will only increase as Acadia approaches its 2018 target for the final plan. 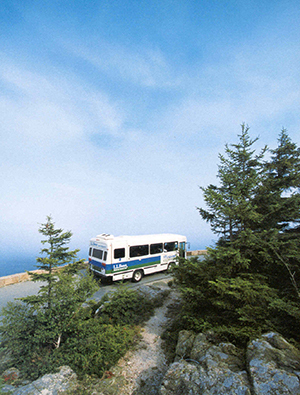 Consider a car-free visit to Acadia National Park! See our “car-free and carefree” guide for tips and ideas.